Victor Oladipo racks up 22 points and dishes out 10 assists as the Pacers edge the Heat, 110-102. 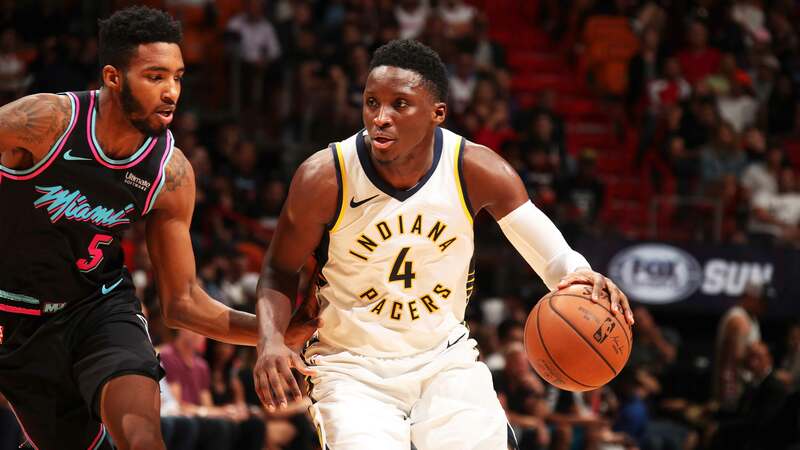 November 9, 2018 - Pacers head coach Nate McMillan and players Victor Oladipo and Myles Turner talked about how defense helped lead the way during their 110-102 win over the Miami Heat on Friday night. November 09, 2018: The Pacers make the extra pass to get Bojan Bogdanovic an open three. November 09, 2018: Pacers gain some momentum with a big corner three from Doug McDermott. November 09, 2018: Tyreke drives it into the lane to earn two tough points at the rim. 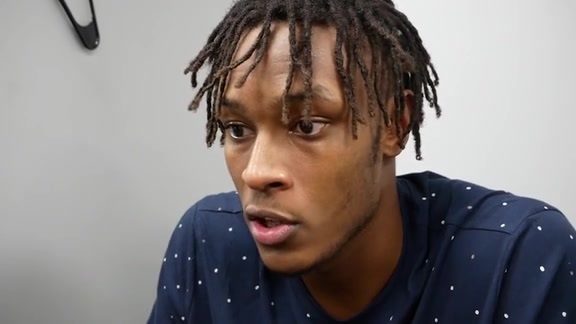 November 09, 2018: Myles Turner sets a pick and roll that leads to a vicious dunk! November 09, 2018: Oladipo's steal leads to two points for Darren Collison in transition. November 09, 2018: The pick and roll by Sabonis leads to a huge dunk! November 09, 2018: Tyreke showing off the hesitation to give him an easy 2-points. November 09, 2018: Collison's block leads to a near dunk on the other end. November 09, 2018: Huge 3-pointer for Bojan Bogdanovic gives the Pacers the lead. The Indiana Pacers battled their way to a tough 110-102 road win against the Miami Heat on Friday night. Despite continued woes at the free-throw line and losing Thad Young to ejection late in the second quarter, the Pacers made enough plays in the fourth quarter to win their fourth road game in a row. In the fourth, Indiana led 90-87 before Miami nailed back-to-back triples to retake the lead with 6:55 to go. Miami led 102-98 with 1:38 to play, but from there the Pacers took over. The score was 102-100 with under a minute to play, and Bojan Bogdanovic drilled a 3-pointer to give the Pacers a one-point lead. After a defensive stop, Victor Oladipo knocked down a jump shot to give Indiana a 105-102 advantage with 32 seconds left. After a Miami turnover, the Heat sent the Pacers to the free-throw line, and though they struggled mightily from the charity stripe on the night (17-of-29, 58.6 percent), Darren Collison made a pair the team had to have to put Indiana up five. After another Heat turnover, Victor Oladipo sealed the game with a three-point play, and in all, the Pacers ended the game with a 12-0 run to leave Miami with a victory. Prolific scoring wasn't the case in the early going, as both offenses were sluggish out of the gate. With 5:38 to play in the opening quarter the teams had only combined for 23 points, as the Pacers led 12-11. Miami took the lead with a 7-0 run to lead 18-12, but the Pacers fired right and tied things at 20 with 1:57 left in the first. When the quarter came to a close Miami led 26-24. Miami came out firing in the second. Led by four 3-pointers in the early stages of the quarter, the Heat opened up a 43-32 lead with 7:52 to play in the half. The Pacers would get back into it though, as a Myles Turner dunk at the 2:31 mark cut the deficit to two, 49-47. Less than a minute later, the Pacers lost Thad Young for the game as he was ejected for a Flagrant 2 foul against Kelly Olynyk. Miami finished the half on a 10-4 run to lead 59-51. To start the third, Indiana quickly cut into its halftime deficit to a single digit, thanks to a 7-0 run. The Pacers took its first lead of the quarter, 76-74, with 3:11 left in the third. Miami regained the lead soon after, 79-78, but the Pacers ended the quarter with a 6-1 spurt to lead 84-80 heading into the final period, where they were able to hold off Miami. The Pacers were led by 22 points and 10 assists from Oladipo. Off the bench, Domantas Sabonis contributed 17 points and 11 rebounds. For Miami, Olynyk was its leading scorer with 20 points. Josh Richardson added 18. Cory Joseph scored a season high 14 points tonight. The Pacers won the turnover battle, committing 18 to Miami's 23. 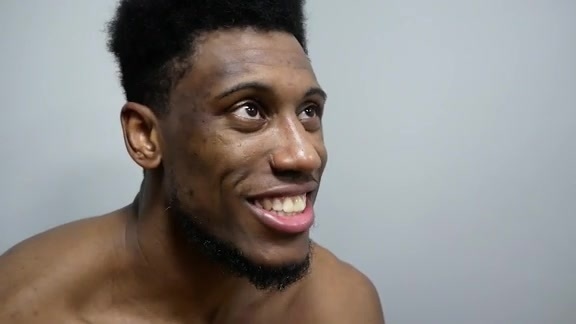 The Pacers ended the game with a 12-0 run to turn a 102-98 deficit into a 110-102 victory in the span of 1:38. Victor Oladipo and Domantas Sabonis both finished with double-doubles. Tonight's was Oladipo's second on the season. Sabonis now has five this year. The Pacers are now 5-2 on the road. Myles Turner finished with a team high +/- rating of +20. The Pacers' next game is in Houston against the Rockets. The teams meet Sunday at 7:00 PM ET. Catch the action on Fox Sports Indiana and 1070 The Fan.